Graco Inc. GGG recently reinforced its innovation platform with the launch of the Pulse Fluid Management system for vehicle service. The latest wireless system, which includes the company’s popular fluid-management technology, will provide futuristic service operations. These processes will drive profitability and simplify decisions through appropriate control, analytics and insight. Graco developed the Pulse system by redesigning its Matrix Total Fluid Management System. The restructured wireless fluid-management system enables managers and other major stakeholders to access reporting tools and monitor business from different types of network-coupled devices like tablets, smartphones or PCs. Additionally, the technicians will be able to access the type, proportion, dispensing time and purpose of a fluid through Graco’s latest Pulse system. Notably, users can estimate the cost or uncover the hidden profits through this system, by effortlessly tracking fluid activities and monitoring inventories. We believe the company’s latest move is in sync with Graco’s innovation-based growth strategy. The company currently carries a Zacks Rank #2 (Buy). 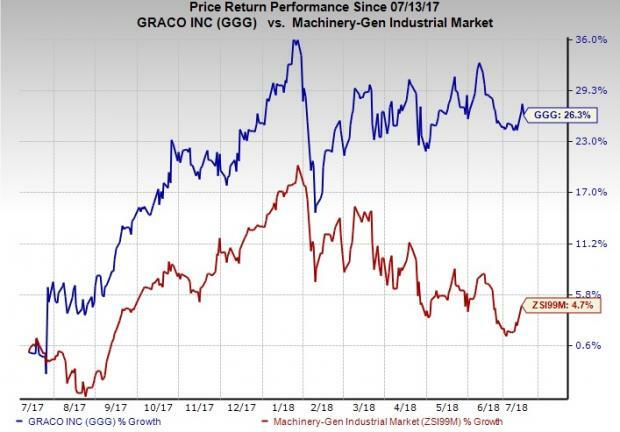 Over the past year, Graco’s shares have rallied 26.3%, outperforming 4.7% growth recorded by the industry. Stronger U.S. manufacturing demand will likely continue to boost the company’s revenues in the quarters ahead. Moreover, strategic business acquisitions and favorable foreign currency-translation impact are expected to drive top and bottom-line growth, going forward. Per our estimates, Graco’s year-over-year revenue and earnings growth for 2018 are currently pegged at 11.7% and 32.2%, respectively. Chart Industries, Inc. GTLS sports a Zacks Rank of 1 (Strong Buy). The company’s earnings per share (EPS) are predicted to grow 26.9% in the next three to five years. You can see the complete list of today’s Zacks #1 Rank stocks here. Welbilt, Inc. WBT holds a Zacks Rank #2. The company’s EPS is likely to be up 10%, over the next three to five years. Roper Technologies, Inc. ROP also carries a Zacks Rank of 2. The company’s EPS is projected to rise 12.3% during the same time frame.